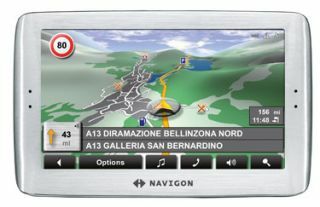 Navigon's first sat nav device with Panorama View 3D - theNavigon 8110 - is now available in the UK. Navigon claims that the 3D view offered by the Navigon 8110 offers a safer driving experience, giving drivers a better view of difficult-to-maneuver junctions and the like. But then, Navigon would say that! The new sat nav also features include a 4.8-inch display, full maps of Europe, TMC Pro for re-routing, Bluetooth connectivity for hooking up to your phone, USB connectivity, free map updates, an MP3 player and an FM transmitter. In short, it's one of the better sat navs on the shelf right now, which is reflected in the price of £389.99. Want one? Head to Navigon.com to do the business.